Many of my readers know about my friend who lives on the 104th floor in a Tower in Mumbai. He is the richest person in the world today. He is undoubtedly one of the most influential personalities and yet not known due to his sheer humility and discreteness. I went to see my friend on 104th floor on this Sunday morning. He was having a breakfast. “I am just returning from China” he said – while picking an Arabian date from a silver bowl. “I made a deal to start a plastic manufacturing facility near Aurangabad in Maharashtra with Chi Mei Corporation in Tainan City. This facility will be the largest in the world and will meet India’s plastic products related demand till 2030. We will produce plastic bags, plastic cutlery and plastic bottles”. He said. “Do you know that plastic processing is the pillar of economy in most of the advanced nation? Per capita consumption of the world is 28 kg whereas India’s 11 kg and China 38 kg and Brazil 32 kgs. In USA, Germany, UK, Italy, Spain, Australia, Japan, Korea, Taiwan it is more than 100 kg. This means India has big potential to grow, improve quality of life of its citizens and seize many opportunities. I was surprised with his argument. Probably, my friend did not see the “down side” of plastic. India generates around 5.6 million tons of plastic waste annually, where Delhi alone accounts for 9,600 metric tons per day. The uncollected plastic chokes our drains causing flooding and fills our landfills forever as the plastic does not readily degrade. We need to reduce consumption of plastic in our daily lives and increase the recycling rate. This will require use of alternatives to plastic, segregation of plastic at source, collection/reverse logistics for used plastic, discovering/using new materials and practicing innovative business models. In India, we haven’t done much on all these fronts. So, I kept quiet. My friend continued. “He indeed is”, my friend beamed while taking a gulp of pomegranate juice from an intricately carved Putter mug. I don’t think my friend knew that Government of Maharashtra just banned plastic flags, banners, flex material, disposable containers, non-woven polypropylene bags along with all kinds of plastic bags irrespective of thickness. The ban list included disposable utensils made of plastic and thermocol, plastic plates, bowls, cups, straws, cutlery, glass, bowls, forks, spoons, straw, non-woven polypropylene bags, plastic sheets and plastic pouches — and all kinds of plastic films. Use, sale, production, stock and distribution of these plastic products is now prohibited. Some say that this plastic ban was a political move as most plastic manufacturers belonged to the opposition party. Of course, who would believe such a hoax “breaking news”? I explained this new development to my friend. He showed some surprise while applying marmite, imported from London, on a well toasted wheat grain bread. I knew that this plastic ban will be affecting financial viability of my Friend’s mega project. “Well Dr Modak, I will make what Government wants, will allow and support” He said calmly. He did not seem to be perturbed. Perhaps my friend could sense that decision taken by the Government of Maharashtra on plastic ban was not on rational grounds. There was least preparedness on monitoring and enforcement of the ban and alternatives were not provided or facilitated that were feasible and acceptable. And the ban was not well orchestrated with regard to economic instruments. There wasn’t any concerted effort on raising public awareness either. Maharashtra is now the 18th state in India to enforce a complete ban on plastic bags. The experience on the ban in other States has not been satisfactory. “When you cannot ban a corrupt Politician to stand for elections, how can you be successful in banning a plastic bag. Both cause equal menace, don’t they?” I said to myself while sipping a Java coffee. I thought of giving my friend more information. Just then my Professor Friend walked in. He got on the breakfast table and asked for two egg whites tossed with herbs. Professor told us that several countries and cities have attempted plastic ban in the past. Ireland was one of the pioneering countries in banning plastic. In 2002, the country passed a plastic bag tax under which consumers would have to purchase bags. The law was tremendously successful as within weeks of its implementation there was a reduction of 94 percent in plastic bag use. Recently, in Africa, Rwanda and Kenya went ahead and placed plastic bans. France was the first country to pass a law banning all kinds of plastic – plates, cups, and utensils (in addition to the plastic bags). As per the Plastic Ban law passed in 2016, replacements made with the plastic items must be bio-degradable that can be further composted. Figure below gives a global picture on plastic bans. Professor had this style of speaking as if he is reading a PowerPoint slide –something he was most used to do. And I knew that Professor was both theatrical and theoretical in many occasions. To me circularity in India was more known in the party politics – where you see politicians changing there stand and keep moving in circles. But I thought that this time Professor was right. Globally, an average of eight million tons of plastic escapes collection systems, winding up in the environment and eventually the ocean. According to a study by the Ellen MacArthur Foundation, five trillion pieces of plastic already exist in the world’s oceans. We don’t realize seriousness of the situation as we live on the land mass. Recycling alone is not going to be a solution and besides recycling is not cheap. Producers need to invest in new material designs, drastically reduce and substitute use of plastic packaging and take physical and/or financial responsibility for needed infrastructure, collection and recycling of essential materials. Professor spoke about alternatives such as biodegradable and oxy-degradable plastic, edible cutlery, “leash-the-lid” technology that allows recycling of both bottle and cap and then elaborated on plastic to fuel projects and use of plastic in asphalting of roads. He gave several examples. Wow, I exclaimed. I wish Niti Ayog in India had thought of launching a Plastic Nirmulan Mission to support these bans. Certainly, you need a mission approach. My friend was surprised with this information. He however had questions. He asked whether the edible cutlery was gluten free. He also wondered whether the term biodegradability was defined in India. 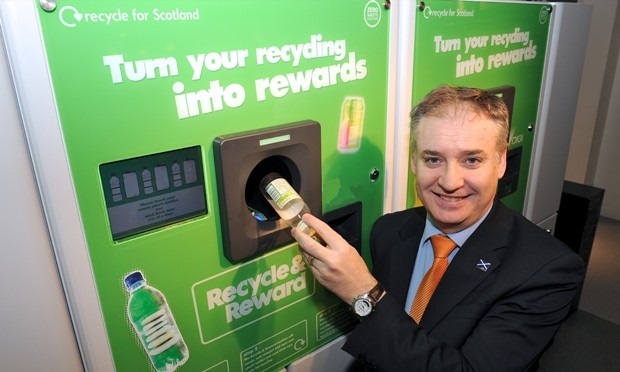 He further asked whether there were quality, safety and health standards with the BIS for plastic recycled products – be it fuel or a recycled plastic bag. We did not have answers. “All this must be looked into” He said in a serious tone. Just then, he received a call on his phone from TOMRA. TOMRA is the world leader in the field of reverse vending, with over 82,000 installations across more than 60 markets across the world. TOMRA provides best machines for collecting and recycling aluminum cans and glass and plastic bottles. Around 35 billion used beverage containers are captured every year by TOMRAs reverse vending machines. He then paused for a while and looked outside the window. “Maybe I will also put a small clip showing the PM and the CM in between”. He said as if an afterthought. I saw that was a smart move given the election times connecting plastic, pollution and politics. These vending machines will surely enjoy substantial subsidies with clips of PM and CM shown. No wonder my friend was the richest man in the world living on the 104th floor. You may like to read my post in 2014 on Plastic, Paper or Reusable Shopping Bag. Whether the edible cutlery was gluten free? Whether the term biodegradability was defined in India? Whether there were quality, safety and health standards with the BIS for plastic recycled products – be it fuel or a recycled plastic bag? Cloth Bag Vending Machine which RPCB has developed could also be effective in providing in providing an alternate to the plastic carry bag. Government of Maharastra could installed such machines in big way.